Approx 50km north of Bangkok Hotels 80km from Tak is the town of Mae Sot. The city is located next to the River Mai (Moei) that forms the natural border between Thailand and Myanmar. The city has obvious signs of the proximity to the border, and border trade with food, different crafts and Burmese clothing, carpets, jewelry is extremely lively. In 1991, the Myanmar formed border trade in Mae Sot area and started an explosion of black commerce in the area. The street scene is characterized by a variety of ethnic and religious groups, Muslim as well as Burmese Buddhists, Christians, the Karen, and meo, who are animists and Buddhists of Thai descent. 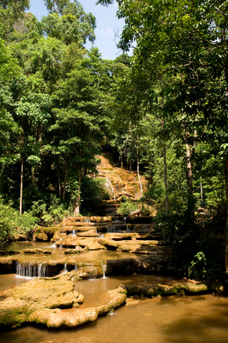 Mae Sot is excellent as a base for wilderness trips, this allows you to arrange this at home or on location. Flights to Bangkok and then domestic flights in Thailand to Mae Sot that take you into the wilderness and all the discoveries. Mon Krating is one of the wilderness areas about 11 mil from the city. This area with mist-shrouded mountains, dense rain forests are being rapidly discovered by tourists wilderness. The population here consists only of qualifying descendants. One of the site's major attractions is usucave which is a stalactite cave and an underground river.